Peter Hemings was a slave who became head cook at Monticello in 1796, after Jefferson freed his brother James, the previous chef. (They and their sister Sally were probably the children of Jefferson’s late wife’s father.) James had trained in Paris and taught his brother French cooking techniques, but there was a strong tradition of Anglo-American food at Monticello as well. The muffins that Jefferson loved so much were yeast raised and cooked on the griddle — what we now call English muffins. To a quart of flour put two table spoonsfull of yeast. Mix … the flour up with water so thin that the dough will stick to the table. Our cook takes it up and throws it down until it will no longer stick she puts it to rise until morning. In the morning she works the dough over … and makes it into little cakes like biscuit and sets them aside until it is time to back them. You know muffins are backed in a gridle in the hearth of the stove not inside. They bake very quickly. The second plate full is put on the fire when breakfast is sent in and they are ready by the time the first are eaten. When you eat them, toast them crisp on both sides [in a hearth], then with your hand pull them open, and they will be like a honey-comb, lay in as much butter as you intend to use, then clap them together again and set it by the fire. When you think the butter is melted turn them, that both sides may be buttered alike, but do not touch them with a knife, either to spread or cut them open, if you do they will be as heavy as lead, only when they are buttered and done, you may cut them across with a knife. Note that Glasse described the “honey-comb” inside. These 18th century muffins clearly had nooks and crannies, much like modern-day Thomas’s muffins! I don’t think there were any muffin men in America, but 19th century American cookbooks did have recipes like Glasse’s, including Mary Randolph’s The Virginia House-wife (1824). Several decades later, Miss Leslie’s Directions for Cookery (1851) included a similar recipe, called “Water Muffins,” but the batter for these was ladled into rings instead of shaped into rounds. And as the 19th century progressed, muffin recipes often called for milk instead of water. In the 1870s, an Englishman named Samuel Bath Thomas immigrated to New York City and opened a bakery where he made a similar muffin. Thomas’s muffins were soon a hit, his business thrived, and eventually his muffins were sold throughout the United States. 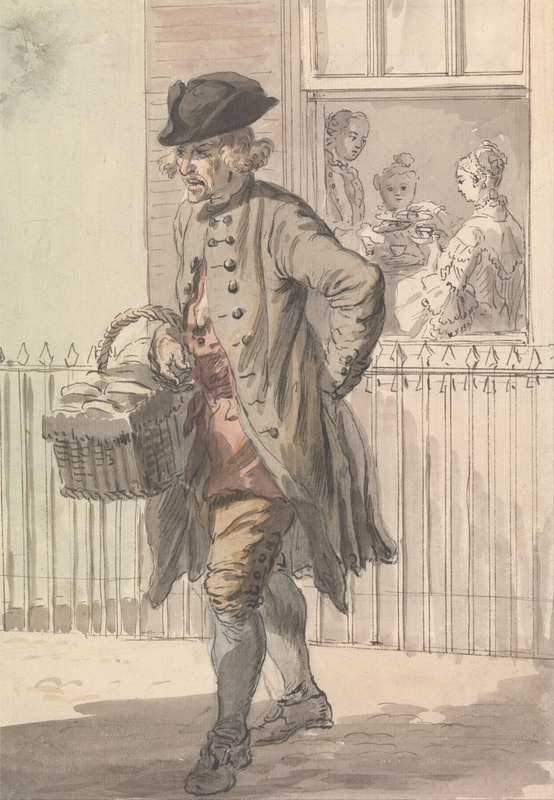 Perhaps it was because of Thomas that they became known as “English muffins.” That term was also used to differentiate them from the sweet cupcake-like muffins, made with baking powder, that became increasingly common. 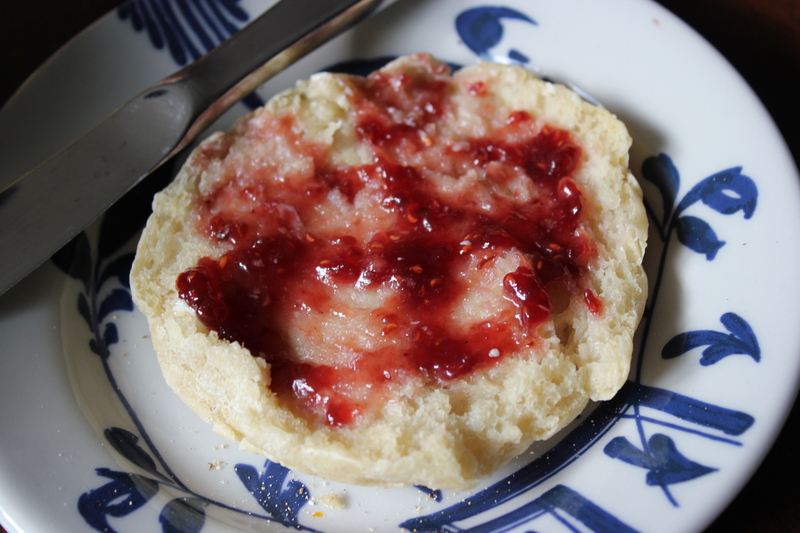 While the English muffin grew in popularity in America, it did the reverse in England, where it was largely supplanted by the crumpet, a similar yeast bread cooked on a griddle. Crumpets are a little softer, and they contain baking powder, which causes holes to form on top. I think English muffins are better, but maybe I’ve just never had a decent crumpet. If anyone can shed light on why the English muffin has become rare in England, I’d love to know. 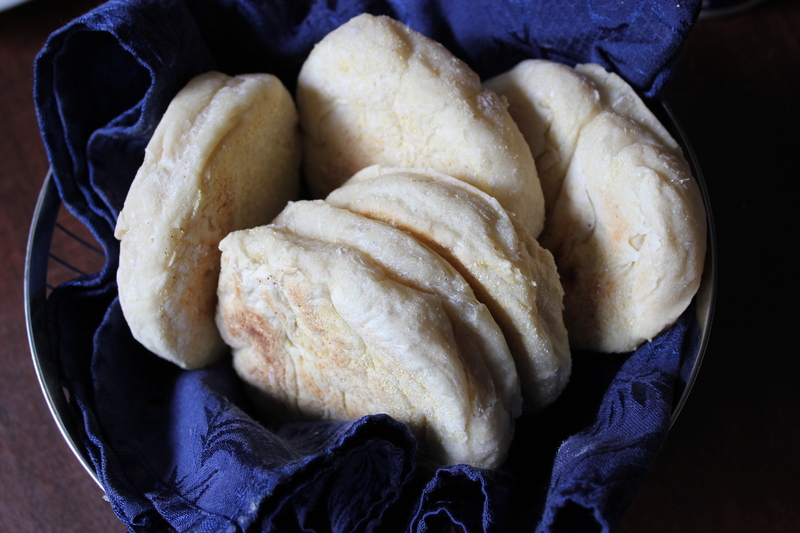 I was curious whether early English muffins tasted like the commercial variety we eat today, so I made an adaptation of the Hemings recipe from the book Dining at Monticello, edited by Damon Lee Fowler. This recipe calls for a combination of white and whole-wheat pastry flour, to better approximate the soft-wheat flour that was used in Jefferson’s time. The only significant change I made was to increase the amount of yeast. My first batch of muffins turned out well, but the dough was very sticky, making it hard to form into rounds. I didn’t attempt throwing the wet dough down as described by Jefferson’s granddaughter, as I was pretty sure that would end badly for me! Instead I made another batch using a little more flour. The result was still sticky, but the dough has to be somewhat wet because moisture is what creates holes inside the muffins — water evaporates when the dough is heated. My second batch were more consistently round, and they tasted good — somewhat like Thomas’s, but softer and fresher. Perhaps there weren’t quite as many nooks and crannies, but their freshness more than made up for that. My family loved them, which was a good thing since we now had several dozen of them. Serve these muffins warm, toasted, and topped with butter, jam, or whatever you like. 1. In a medium bowl, dissolve the yeast in the water, and let sit for about 10 minutes. 2. In a large bowl, whisk together the flours and the salt until well combined. 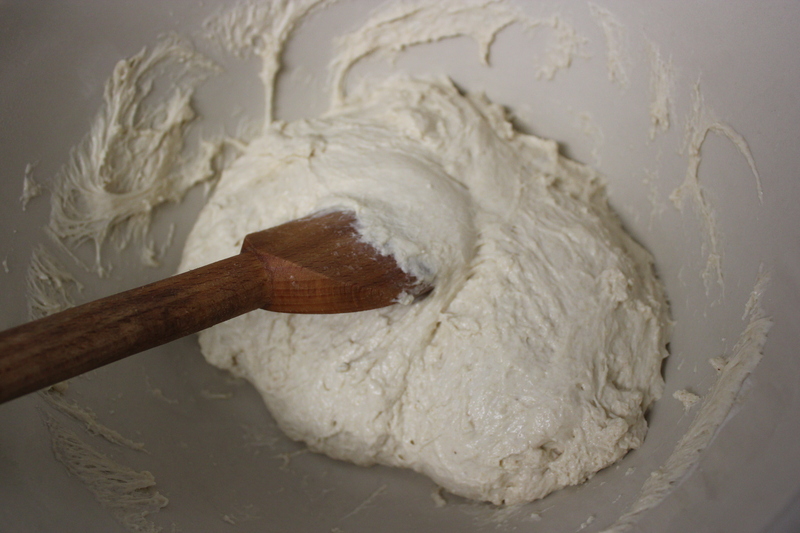 Make a well in the center of the flour and pour in the water-yeast mixture. Gradually stir the flour into the water, then keep stirring until the dough is smooth. 3. Dust a wooden board or other work surface with four tablespoons of cornmeal. Gently deflate the dough with a large spoon, and sprinkle the surface with the remaining cornmeal. 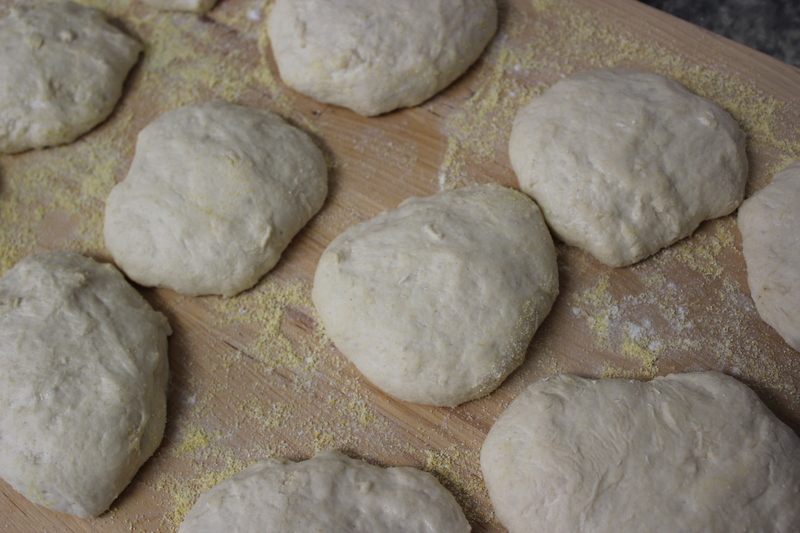 Lightly flour your hands, and pull off handfuls of dough. Form each into a round ball, then flatten that into a disc about one-half inch thick and three inches in diameter. The dough will be sticky and hard to handle, so you’ll need to keep reflouring your hands. Place the discs about one inch apart on the prepared work surface, and let rest for about 20 minutes, allowing them to puff up a little. 4. Heat an ungreased griddle or large, shallow skillet (enameled cast iron works well) over medium-low heat. Using a thin spatula, transfer muffins onto the griddle or skillet, leaving a little space around each. Cook about 8-10 minutes until lightly browned, then flip over, press down on each muffin with the spatula to flatten slightly, and cook for another 7-8 minutes, until lightly browned on the bottom. Watch carefully to make sure they don’t burn. 5. Remove muffins to a rack or plate and cool slightly. Split muffins apart with your fingers or a fork — not a knife. Toast and top with butter, jam, or other toppings. Makes about 12-14 muffins. This entry was posted in breads, muffins and tagged 19th century food, Eliza Leslie, English muffin, food history, Hannah Glasse, Monticello, muffin, Peter Hemings, Thomas Jefferson, yeast bread by revolutionarypie. Bookmark the permalink. Brilliant. Such great and interesting history. These look fabulous. I want to try them! Thanks, Amanda. Good luck if you do make them. Except for the actual shaping, they’re easy. Fascinating. I knew the British part of the muffin’s history, but not any of the American anecdotes. Your muffins look quite delicious, and remind me that I haven’t made any in ages. Thank you! My muffins are much denser than yours, so I should give them a try too and see which ones I like best! Glad you liked it, Jess! Very, very interesting. I always liked TJ! However, I was a bit perplexed by your statement that crumpets used baking powder. I also saw this on The Kitchn post recently. Most recipes I know use yeast. The major difference that I can tell is the runnier batter for crumpets and the fact that it is only cooked using a ring on the griddle and not flipped over so that the holes rise to the top and open. A crumpet is eaten without cutting in half, generally toasted and slathered in butter to fill those holes. Ambrosia. A lot of sources said that both yeast and baking powder were used. I think there’s confusion because the crumpet has changed over time, so there are different methods. But you’re right that the older ones had only yeast — I just saw a 1769 recipe by Elizabeth Raffald calling for yeast (barm) and eggs. Since there was no baking powder pre-19th century, I should have been more suspicious! I also see some modern crumpet recipes with eggs, some without. Anyway, I’m glad to hear they can be delicious. I’ll try to keep an open mind! Fascinating post — love all the history and your muffins look so yummy. I’ve always wondered why English muffins are not as popular in England, and like you, I prefer them to crumpets. Hi William. Sorry I wasn’t clearer — I meant less yeast than was called for in the Dining at Monticello recipe, and the amount there was probably a typo as it said 1/4 teaspoon! As for the whole wheat pastry flour, you’re right, but Damon Fowler (that book’s editor) recommended using a small amount of it in combination with regular all-purpose flour, to produce something “reasonably similar to that used at Monticello”, where soft-wheat, low-gluten flour milled from winter wheat was used. There’s a fairly lengthy discussion in the book about 18th century flour and the authenticity issue — and I am not a flour expert so should stay out of this debate. (Or is it too late for that? ;-)) Fowler did write that Southern brands of soft white flour would give good results — I think he was just trying to give an alternative to people who can’t easily obtain it. Thanks very much for the link to Anson Mills! Thanks for this post. Did you see that Monticello was almost never restored and opened to the public? http://www.nytimes.com/2015/02/08/upshot/the-near-death-and-revival-of-monticello.html?_r=0 I’m glad Jefferson’s home and his family recipes have been preserved. Do you think people used muffin rings back then? I see you didn’t so I wondered about that. I did see that article — it was fascinating! About the rings: I didn’t see them in cookbooks from Jefferson’s time, but perhaps they’re in some manuscript cookbooks from that period. I know they were in use by the 1830s. I’m going to do some more digging on this and will let you know what I find out. In the better-late-than-never department: The earliest mention I could find was in Eliza Leslie’s 1828 Seventy-five Receipts for Pastry, Cakes, and Sweetmeats. I’m so excited and really keen to make these English muffins! Such an informative post and significant discussion in Comments too. Concerning crumpets, I’ve made crumpets for my blog using yeast and bicarbonate of soda rather than baking powder. I agree, logically yeast would have been the historical raising agent used. So how did cupcake muffins get that name? They are so unlike English muffins, particularly the sugary commercial variety which is essentially an oversized cupcake. Can you shed any light on this? Hi Inga, sorry for the late reply. I think cupcake-style muffins just evolved over time from English muffins. In the U.S., starting in the second half of the 19th century, “quick muffins” made with baking powder became popular. These were sometimes made with flours like corn or graham. At first they were baked in muffin rings, but eventually in pans with connected cups. There was little or no sugar in them, though — that didn’t happen until well into the 20th century. Foodtimeline.org says more muffin varieties, some of them sweeter, appeared in cookbooks starting in the 1920s, but “muffin madness,” with gigantic sugary muffins, didn’t occur until the 1970s, as you say. And I guess we can blame that on American super-sizing. The cupcake has a different history, but the two ended up being very similar. I’m not sure I’ve answered your question, but I tried! And as for the English muffins, it’s interesting that they are apparently common in Australia as well as the U.S. I’ve seen that all over the Web. Why did this English export not thrive in England? Anyway, I hope you have success with the muffins! I’m so excited to try this recipe although we do not eat much bread/flour products. 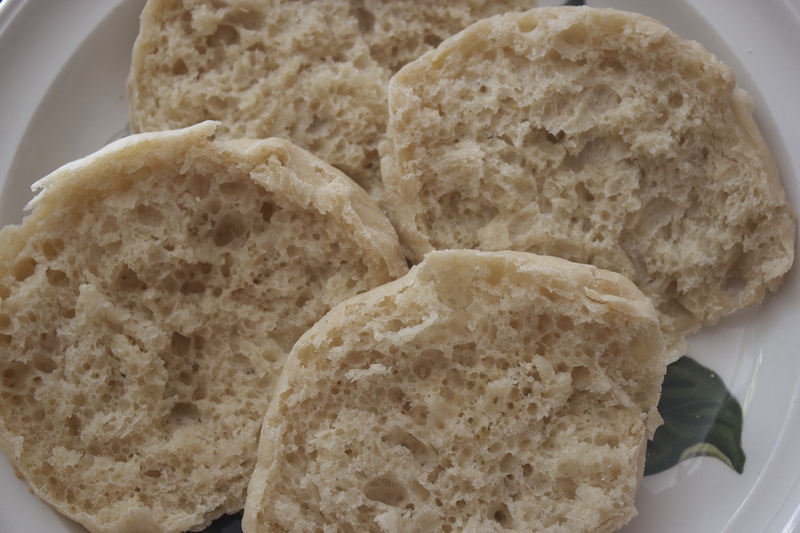 Modern English muffins to me are ruined with the addition of dough conditioners and preservatives. When making our no-knead bread, only 1/4 tsp. of yeast is used with a very long ferment/rise time .. which would give a more sour dough flavor. Humm, off to experiment! That’s interesting! But Dining at Monticello called for “1/4 teaspoon active dry yeast or 1/2 ounce compressed fresh yeast,” and I looked at a conversion chart and those aren’t equivalent, so I’m sticking with 1/4 ounce active dry yeast. If you have success with a smaller amount, though, do let me know! Yes the hemings children are actually Thomas Jefferson’s legitimate children, how must you remain willfully ignorant. Hi Solar, thanks for visiting. I was referring to the previous generation — the children of Jefferson’s father-in-law, John Wayles.